A strain is an injury to either a muscle or tendon. Tendons are the tough, fibrous bands of tissue that connect muscle to bone. 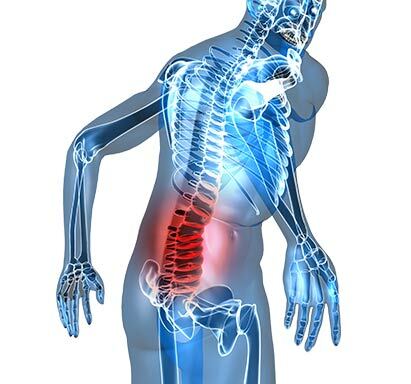 With a back strain, the muscles and tendons that support the spine are twisted, pulled, or torn. A sprain is the stretching or tearing of a ligament. Ligaments are the fibrous bands of tissue that connect two or more bones at a joint and prevent excessive movement of the joint. Symptoms of a strain and/or sprain include: pain that increases with movement, muscle cramping or spasms, decreased range of motion in the spine. The patient may feel a “popping or tearing” at the time of injury. Twisting or pulling a muscle or tendon can result in a strain. It can also be caused by a single instance of improper lifting or by overstressing the back muscles. A chronic strain usually results from overuse involving prolonged, repetitive movement of the muscles and tendons. A sprain often results from a fall or sudden twist, or a blow to the body that forces a joint out of its normal position. All of these conditions stretch one or more ligaments beyond their normal range of movement, causing injury. Poor posture, weak abdominal muscles, repetitive heavy work, and obesity all also lead to an increase in sprain/stains of the lumbar spine. Treatment is usually rest/ medications/ ice/ heat for the first 24 hours and then exercise. In general, most low back sprains-strains are expected to heal without the need for any future restrictions.